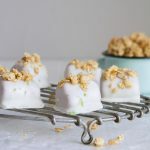 These healthy tropical smoothie bites are enrobed in a silky-smooth lime coconut milk and topped with granola for a satisfying sweet treat. These tropical smoothie bites are the perfect healthy snack for this time of year. Now you may be thinking I’m crazy considering it’s downright freezing outside, but hear me out. One, you actually don’t need to use the freezer because you can just pop them outside. Two, they are a healthy snack and dessert choice. (We all know that’s a win.) Three, they are incredibly easy to make. And four, the flavors will transport you to a place far, far away filled with palm trees, sunshine, and sand. I’m an evening snack fiend, and it’s usually ice cream or cereal, or a combination of the two. No matter the weather, I love a good frozen treat. And if you’re like me and like to end the day on a sweet, healthy note, Froozers are a great choice. They’re made completely of whole fruits and have no added sugars, they satisfy that sweet tooth without bringing on any guilt. 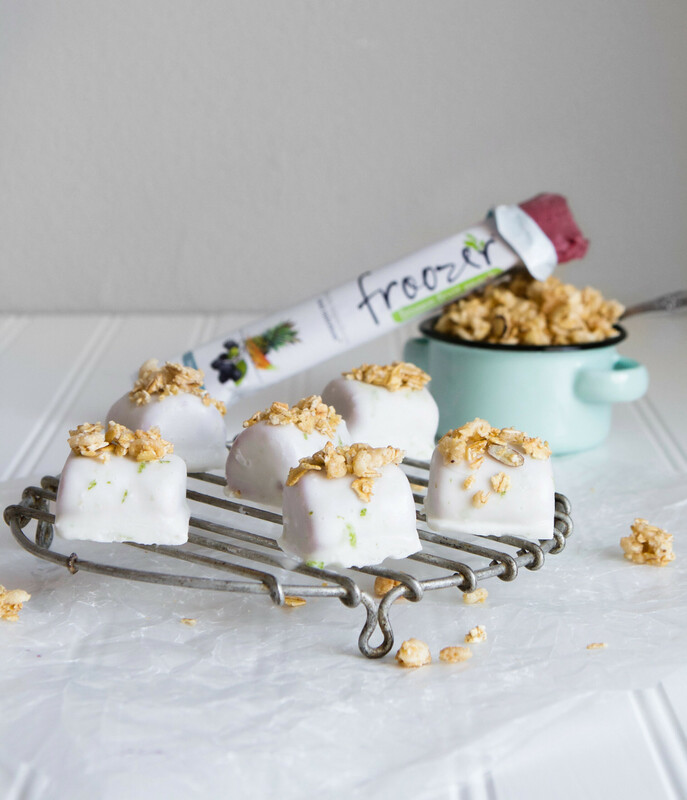 For this healthy treat, I dip Froozers in lime-flavored coconut milk and top with crunchy granola for a tropical treat that satisfies now matter the season. Combine coconut milk, agave, and lime zest in a bowl. Using a fork, individually dip pieces in coconut milk mixture to coat. Let excess drip off, then transfer pieces to prepared baking sheet and freeze until set, 10 minutes. Repeat dipping and freezing twice more. Dip pieces in coconut milk mixture once more and immediately sprinkle the tops of each piece with granola; transfer back to baking sheet and freeze until firm, about 30 minutes. For this recipe, prep time represents time spent chilling, and cooking time represents hands-on time. This post was sponsored by Froozer, as always the thoughts, opinions, recipe, photos, and content are all my own. These look like the perfect little snack bites! L O V E the tropical flavor and the coconut milk! Thank you! I’ve been munching on them all week! What a great idea! Plus they are healthy 🙂 that is a win, win! YUUUM. I’ve never had nor thought to try a smoothie bite, but these are beyond genius. 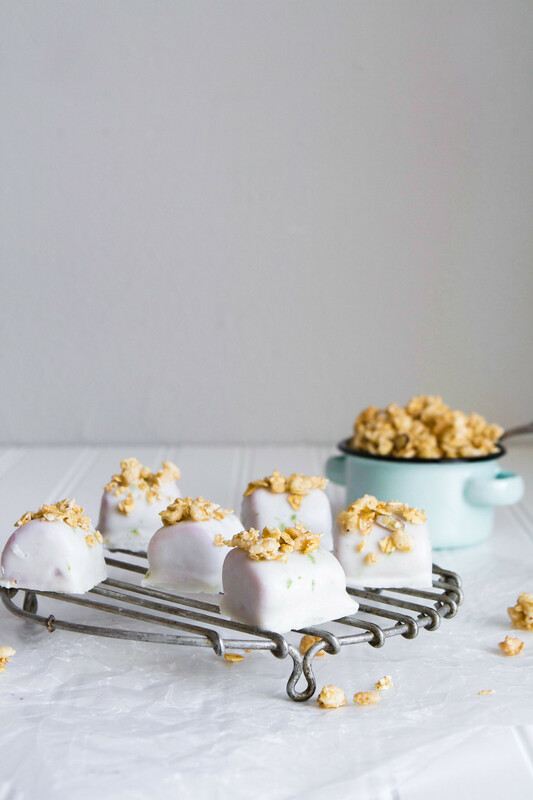 THe perfect little poppable snacks! Can’t wait to make these with my son. I think he is going to love them. Cheers to a zestfulkitchen and to these little beauties! Happy feasting.